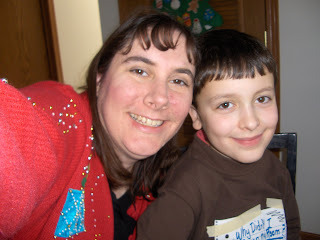 My dear MOPS friend Sherilyn (who is now a neighbor in my new neighborhood) has Blog Tagged me. Who knew this even existed? Now that I'm an aware (and tagged) blogger, I figure I should set out to answer the challenge. I thought everyone should have a picture of me to see while they read this---but the last photo I can find of myself (that is easy to see me in) was taken by me on Christmas Day. Isn't that the way it is for a scrapbooking mom? I have hundreds of photos of everyone else and zippo of me. 1. What is the one BIG goal you hope to accomplish this week? ***Really work on organizing my photos in my Creative Memories Photo Manager. I just learned a bunch of new information on Friday and I want to make the software work for me. 2. What is the one household chore you do NOT like to do? ***It's always been toilets, but now that I join my MOPS Mentor Alison in "Toilet Monday" I don't dread them as much. Now it's dusting--which is such a waste of time since it just gets dusty again! ***First, I'd tithe. Then, I'd resize my wedding ring, purchase a laptop computer for myself and I would take Sean & myself out on a nice date at a place with REAL silverware and a server (not pick up your own food wrapped in paper and eat with plastic utensils). 4. Describe yourself using one word. 5. What is the one saying or theme that you live by? ***"Success is a journey, not a destination." and "One hundred years from now it will not matter what my bank account was, the sort of house I lived in or the kind of car I drove. BUT, the world may be a little better because I was important in the life of a child." excerpt from Within My Power by Forest Witcraft. 6. What is one household item you can’t live without? 7. If you had one chance to go any where in the world where would you go? ***New Zealand--hopefully with a stopover in Australia. 8. List the one person you admire the most. ***Again--ONE???? What's with you Blog Tag people?? Ummm---all my friends who have been great examples of faith and have shown me how to live out Lifestyle Evangelism. 9. What is one thing people may not know about you? ***Someday I'd like to be back onstage in a local theatrical production. And, I plan to rock-a-bye with preemies as a volunteer at Children's Hospital when all three kids are in school all day. Now I’m tagging Cheryl and Holly. Looking forward reading what they have to say. Everyone else, I want to know what you say as well---post your answers in my comments section so I can learn about you.